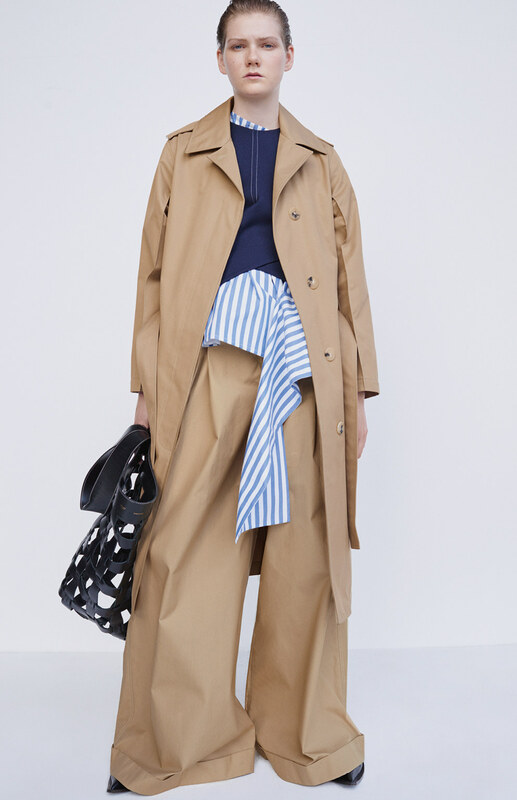 Its seems counter intuitive, but yes, RESORT elements are currently percolating into the stores taking up their place amongst the fall winter and pre-fall lingerers as icicles rapidly multiply at an alarming pace. As you wander through the stores and boutiques bundled in heavy woolens and parkas, you have to remind yourself that yes, you do need those cotton khakis, white tuxedo shirts, and lightweight trenches. And of course when confronting the broiling infernos of overheated buildings, cottons and fine merinos start to make sense during the middle of winter. Always think LAYERS. 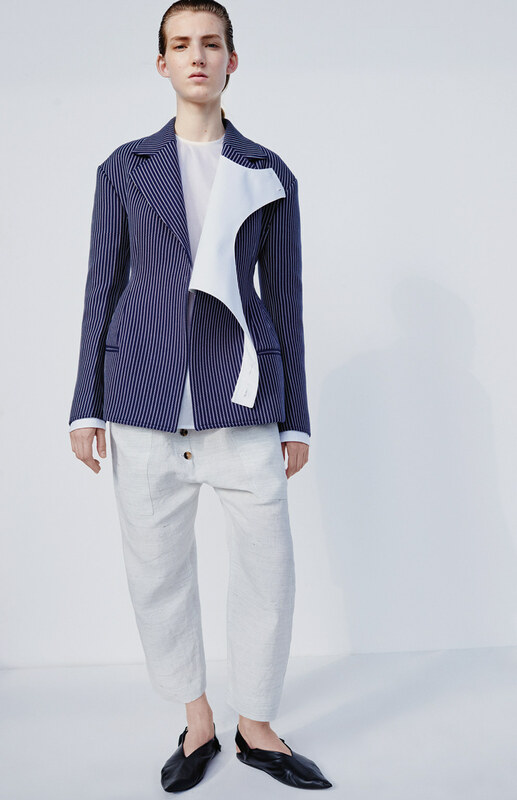 And who better to outfit you for your next spring sojourn than Phoebe Philo, the designer bringing us modern, fashion forward, and hip avant-garde pieces you actually WANT to put on and be seen in public in? These are statement pieces that won't leave you feeling like the world's biggest fashion victim and rube. "Yeah, I know I looked like a ninja bee keeper in the outfit, but the sales associate told me I looked so fierce…..". Um, no, won't happen with CELINE. You never have to worry about banal cohesion in the eclectic assemblies of Philo. No ennui in sight. The varied, unique and WEARABLE silhouettes and sumptuous fabrications will satisfy all generations of fashionistas, from the 20 year old party girl to her Upper East Side Grandma. Even the lovers of the Japanese ethos should be enamored of her renderings. There will be something for e v e r y o n e.
OK, not everyone will "understand" the dropped crotch. But who cares? You'll stay cool and comfy, and those equipped with an understanding of the Japanese fashion wear philosophy will get it. No worries, a good seamstress and some sky high platforms can turn the pants and trench from runway ready to real person ready. The light blue and white stripes are quite casual and inviting, the belt adds some Japanese flavor. A perfect foil for the girly florals that inhabit resort and spring collections. NEVER be afraid to MIX patterns, fabrications, and designers. For a temperate climate, one might add a long vest, in faux fur or shearling. 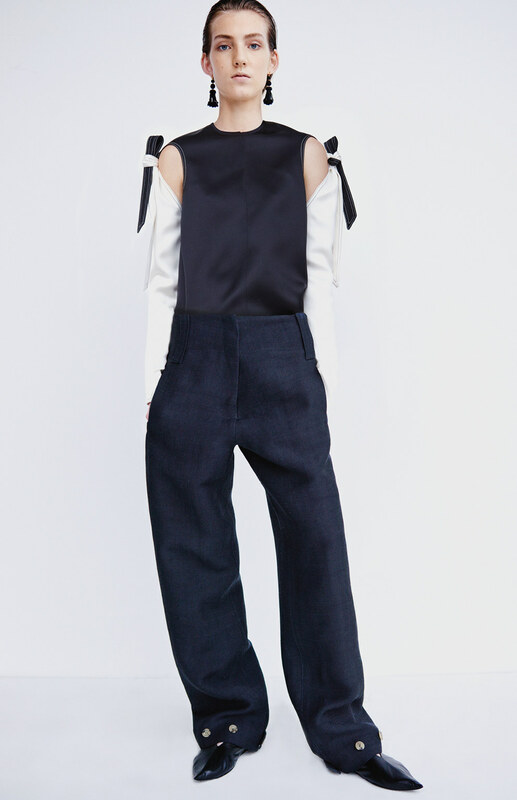 Casual yet well made and effortlessly chic, emblematic of Celine. 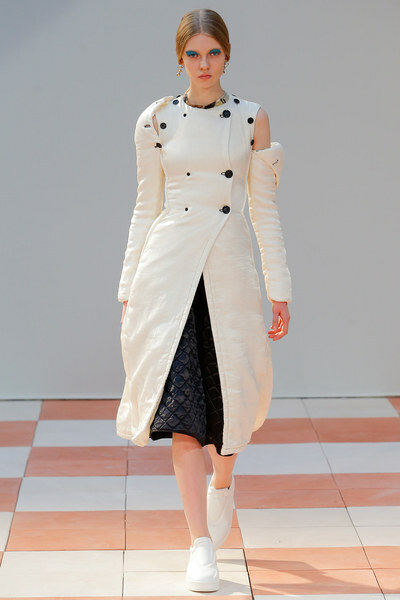 And the jacket is akin to a Dior "bar" jacket, always in style, no matter the season or year. I LOVE LOVE LOVE this outfit. 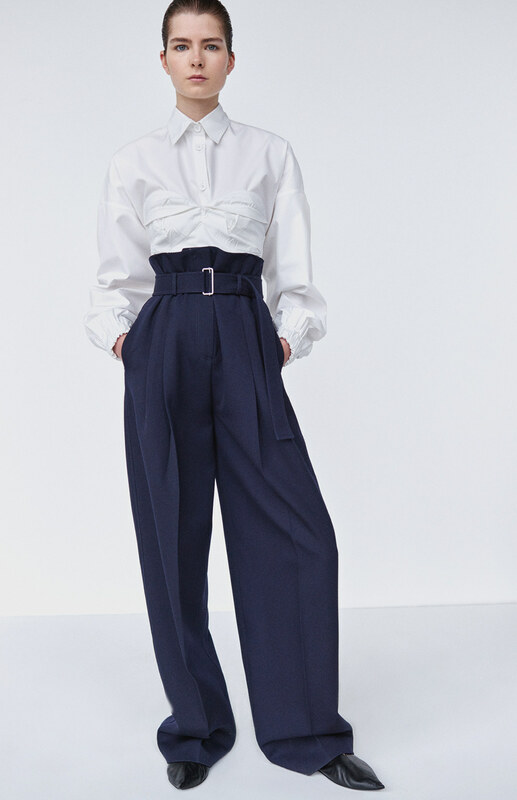 With the flared capacious pants, the blouse needs to be streamlined and fitted. But when the temperate drops, a cropped sweater or fitted cardigan (in a vibrant red or fuchsia maybe) would be smashing. I'm a constant fan of slacks, leggings and jeans…..no need to shave the legs. Pair the blouse with a voluminous long white skirt and espadrilles for that Hampton's vaca. 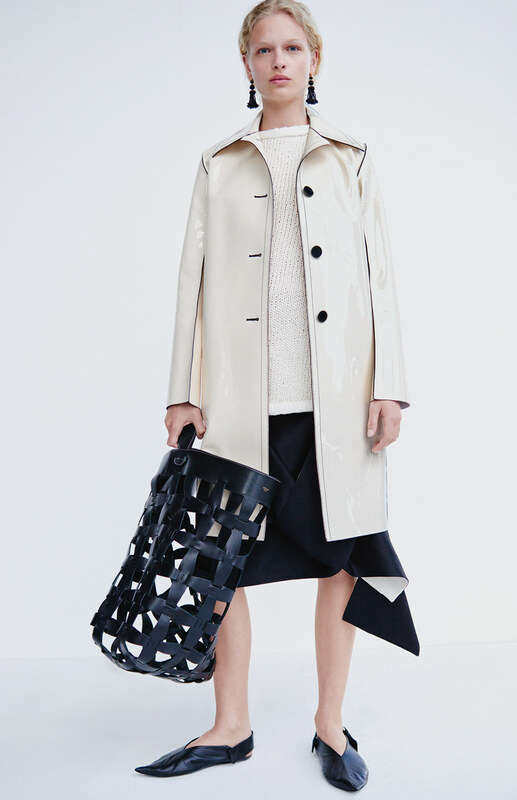 Yum, eggshell patent leather jacket. Low level lux. Wear with slacks, the sweater du jour, a bright Hermes scarf, and which ever shoes strike your fancy. Even clogs! Long and dramatic, yet streamlined and non-fussy. Philo is a fan of the double breasted button patrol. Love the buttoned up traditional touches which contrast with her deconstructed and non-conventional elements. And yet, even the buttons are in an asymmetric distribution. You'll turns heads for sure in this ensemble. Wacky and audacious with the unexpected mixture of contrasting colors and varied leathers and KELLY green apron-oid vest. A little ruching goes a LONG way. And even though we have fitted leather AND ruching, the pieces remain stylish and alluring without descending into dubious or tawdry. For the no-skin-showing look, just throw on over a fitted shirt or slip. Wear the top as you might a vest. 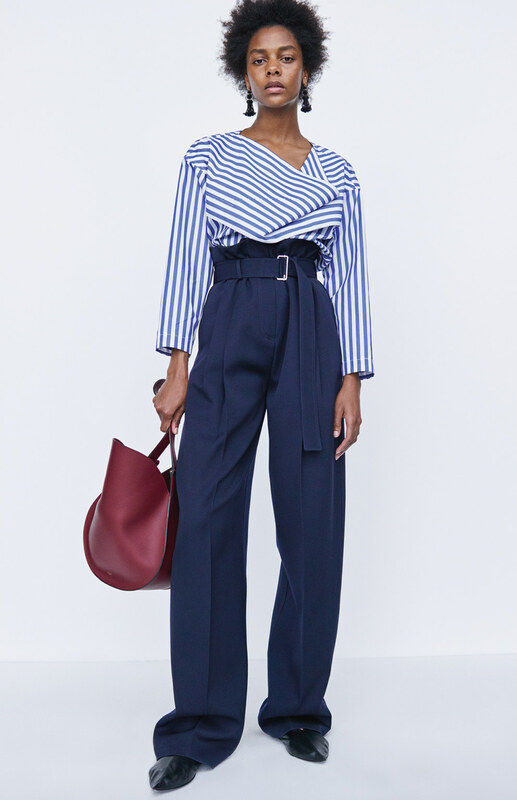 The lightly padded deconstructed skirts, gauntlet sleeves, and hints of skin are an iteration of fall winter (see below) and tend toward the curious and mesmerizing…get out the stacked heel patent leather boots and channel your inner "IT" gal. (Maybe reinforce those buttons….). Is that a blouse wrapped around the waist pretending to be a skirt? Meh, who cares, it looks cool with those wedgy pumps. To avoid going all Morticia Addams, just addsome big baubles around the neck. Think of adding these spectacular beauties to pretty much any outfit, the more casual the better for the striking contrast. 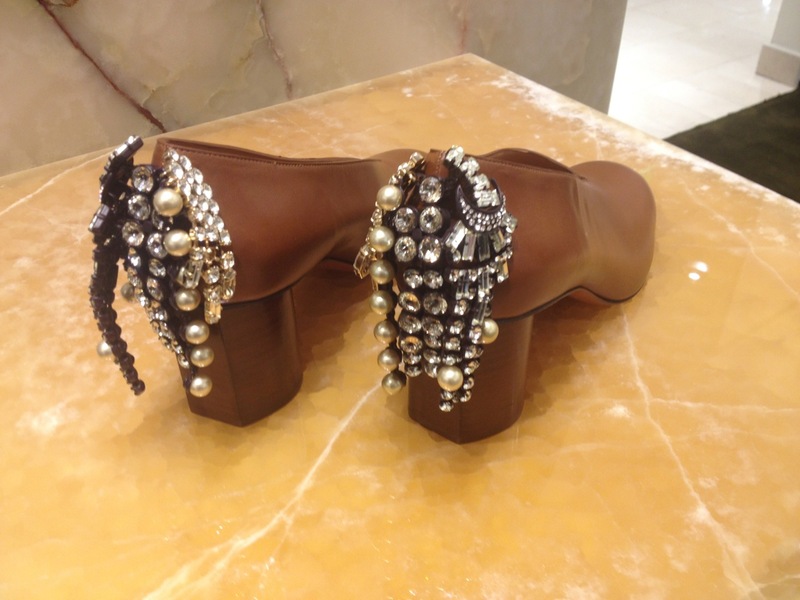 These currently dwell at Neiman Marcus, San Franciso. HUZZAH! "Runway" images care of www.vogue.com.